Small creamy-brown whelk (up to 3 cm in height) it has a pointed, straight sided spire. 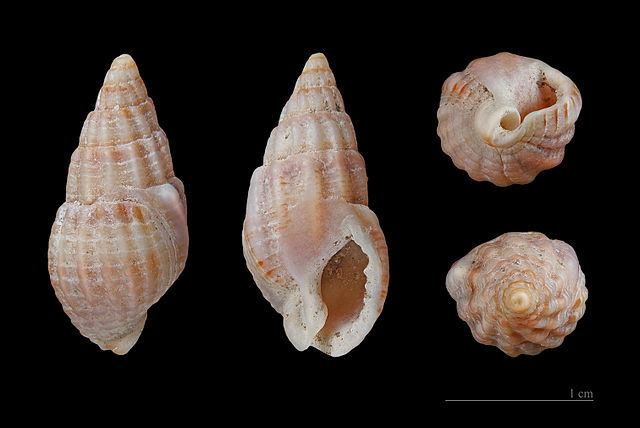 The criss-crossing reticulaions of longitudinal and spiral ridges gives the whelk its visible netted appearance. The apeture is oval with an outer lip that is thickened and toothed in mature animals.Inner lip extends over the body-whorl and the siphonal canal is deep and set at an oblique angle. Size Up to 3 cm in height. Shell with netted (reticulated) pattern. Aperture small and oval with a short siphonal canal. Outer lip of aperture bears internal teeth. Habitat Nassarius reticulatus is found in sedimentary areas of the lower rocky shore and sublittorally to 15 m on soft sediments, where it often buries itself. Nassarius reticulatus feeds on dead and decaying animal matter.